We're in the midst of The Great Toddler Revolt at our house, and I was fairly sure the Dictator would express extreme displeasure at my absence earlier this week. But no. Instead, she was a perfect angel--until approximately three minutes after I walked in the door. Aren't they great? 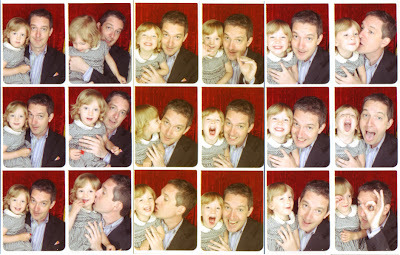 The pictures were taken at a party they attended one evening, where Tsia wasn't sure she wanted to sit in the photo booth until she saw the results. Then Todd couldn't keep her away. I'll be framing the photos; I think they're priceless. So she was just fine without me. In fact, while they were waiting in line to get ice cream at the party she gave Todd a big hug and said, "Tsia happy!" Aww, those photos are too cute! Oh my god, how cute! Those are the best pics ever. Thanks for sharing. so cute! she is looking just like you! Do you have and idea of when you will ship the pattern /kits? I am so excited to get started.